Not to brag, but what an epic day today. Awesome skiing! If anyone here is going to be around either of those spots, let me know and we'll do some runs! Hitting up Blue Mountain this weekend to get my legs for a week in Fernie, BC come Feb. Amazingly excited and itching to post some great session sheets. You should be. This has been an awful winter for the West. Here in Utah there hasn't been a proper valley snowfall since Christmas, and temps this week are supposed to approach 70. I'll stop there before I totally P&C the thread with a hefty garnish of profanity to boot. Yeah, i'm heading to Steamboat next week. Hoping that at least we'll get fair groomers to ride, they're supposed to get a couple of inches fresh by then, but doubtful. Well, we decided to call the Heavenly trip and are rerouting to Colorado instead. Too bad, never skied in Tahoe, but whatcha gonna do? Yup, getting on a plane to Fernie tomorrow morning flying into rain. It's still a vacation so we'll make the best of it. I just saw pictures from a friend who is at Heavenly this week, looks like a dirt farm. You chose wisely, Serengeti. We've had quite a bit of snow here in the northeast. Tonight I discovered that I apparently only know how to ski on machine-groomed snow with a bit of ice for excitement. Packed powder is OK, but big piles of powder carved up into almost-moguls was an unexpected challenge which my knees will be reminding me of tomorrow. This was a school ski club night, but since it's Monday night, the slopes were sparsely populated. It wasn't overly cold, or windy, so it was a really nice night out. That beautiful snow packed empty slope makes my heart sad. Bah, I knew we shouldn't have bought our plane tickets 4 months in advance, but my buddies said it was the lowest price they'd seen and we should just get em. I said we should wait until about 5 or 6 weeks before the trip, but was overruled. Now the three of us together have $1050 in plane tickets that we won't be using, and to change them would cost us $600. Not worth the price to reroute the flights to Colorado when we can drive there in 12 hours and avoid rental car fees, luggage fees, etc. Guess we'll just hold onto them on the off chance that Tahoe gets dumped on in the next month, otherwise we'll just toss em and file it under "lesson learned". Had an amazing week-long ski vacation in VT last week. 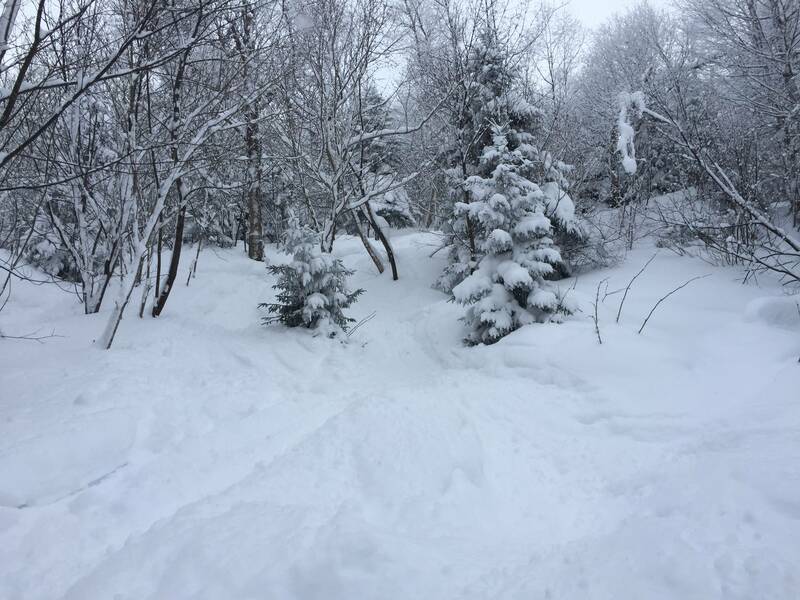 4' of fresh powder at Mad River Glen; spent most of my time there in trees. I *hate* groomed snow -- I find it flat and boring -- so this was heaven. Big technical moguls, deep patches of powder, and tons of fun. Top five skiing day of my life, easily. Back from Fernie, lower mountain was cruddy but I had a great time up high. Great spring skiing in February. This season is backwards. I'm now planning a trip to either Mont-Tremblant or Vermont to make up for conditions on the trip out west! VT conditions are amazing. 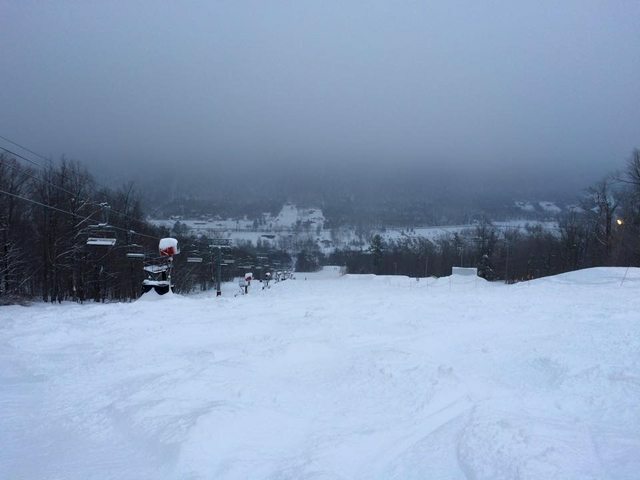 Make sure you hit Mad River and Sugarbush -- some of the best skiing in memory there. We did manage to make it to the slopes during Saturday's temporary warm spell. It was still chilly, and I'm afraid the kids' highlight was visiting the waffle hut for lunch. But that was a rare treat since it's not open when the ski club goes. Saturday brought the first significant snowfall Utah has seen since Christmas. Naturally, it didn't touch the valley, but Alta claimed to have 13 new inches, so even though I was still mid-cold-recovery, I went up, because who the hell knows if it will ever snow here again. It wasn't what we'd call a powder day, but it was winter skiing, conditions which haven't existed yet this year. I don't bring my phone skiing, so I have no pictures, you'll all just have to take my word for it. Awesome! I'll be arriving at Park City sometime on Friday, looking forward to it! Park City is much, much lower than Alta, so it only got in the neighborhood of 4 to 7. Still, it should be ok, and the forecast keeps waffling on whether there will be some precipitation on Saturday or Sunday or neither. Hard to believe that you guys out West are having spring conditions and we're having the coldest season on record in 115 years. I had two clients out of four last week with early signs of frostbite. We've been skiing in in -22C with windchills to -35C. The upside of that is no rain. Usually, by now we've had one or two rains, followed by flash freeze. That tends to make the conditions rather "icy". This year, the snow and lift lines are much better. The -5C weekends days, now and then, have been a treat. Conditions at Canyons today were pretty awesome! Bunch of fresh powder yesterday made for some great runs. Super pic. Very dynamic, especially with all that snow flying. PM me if you'd like to hear some tips that I can see from the photo. Happy for any tips, always have more to learn. Those pics were from gated double black runs, so my primary focus was to keep to a line where I could see the next couple turns and stay in the grooves. Slow and technical down those is my focus. For reference, here's a couple more pics of the terrain. This was definitely the weekend to ski Utah, so glad that worked out for you. Apologies. It's pretentious to presume to be in a position to give out unsolicited advice. I may have had a couple of apres ski beverages that night. Thanks to idle thumbs podcast, though they may have been talking about another video. No worries, the day i stop taking advice is the day i should stop skiing! Also, here's my friend Jeff attempting a sweet jump!